Educators at Weber State University (WSU) led by example Friday night at the opening reception for the Department of Visual Art & Design (DOVAD) Biennial Faculty Exhibition in the campus’ own, Mary Elizabeth Dee Shaw Gallery. 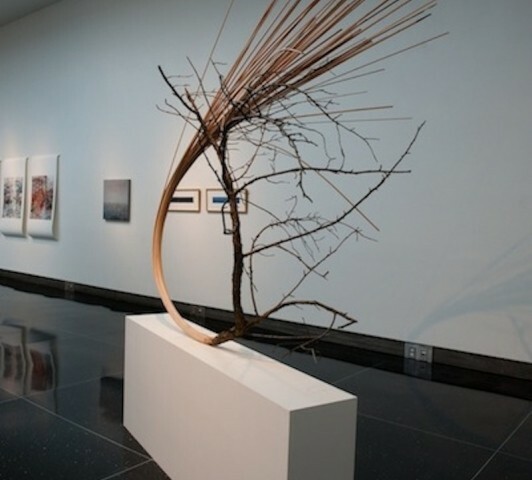 Thirty-one faculty members displayed their works, fifteen of which were female, a record-breaking number on both accounts for faculty participation. The University’s President, Chuck Wight, started the evening by giving thanks to the staff and community and shared a few words on the importance of the exhibition. WSU have long been able to pride themselves on the number of accolades and awards the faculty has received, outnumbering any other university in Utah. President Wight noted that, “the artists are teaching what they are creating, resulting in very passionate knowledge.” He continued by explaining that it was every teacher’s mission to “Provide new prospective, expand minds, and open the hearts [of their students].” The exhibition was an opportunity to not only showcase the arts talents, but also inspire the creative mind. After the brief speech, the attendees filled the gallery. I made my way examining each display. Some pieces had blatant messages, others required a more digestive approach, and a few were void of anything subliminal and just invoked a purely emotional response. Mark Biddle’s submission to the exhibit was among my favorites, despite contradicting my otherwise defined taste. Three large 2500 px X 2500 px images, at first glance presented a vast array of disorganized and erratic lines, revealed itself to be the piece I most engaged with. The digital composition consisted of commonplace objects, text and color, with spatial manipulation of each element. A looking glass effect took over as I zoomed in, each square inch could have be magnified into its own piece. A photo of a woman subtly hid in the background of one, while a recipe for what might have been tortillas or stew streamed across another. My favorite Easter egg was a message that simply stated “Call Carlo 801 814 0909.” QR codes on each pieces name card, when scanned, would take you to the artist’s personal page. Through Biddle’s site, he describes his technique as a “recycled/rehab theme,” and explains his work and his relationship with space and the discarded evidence of everyday life. 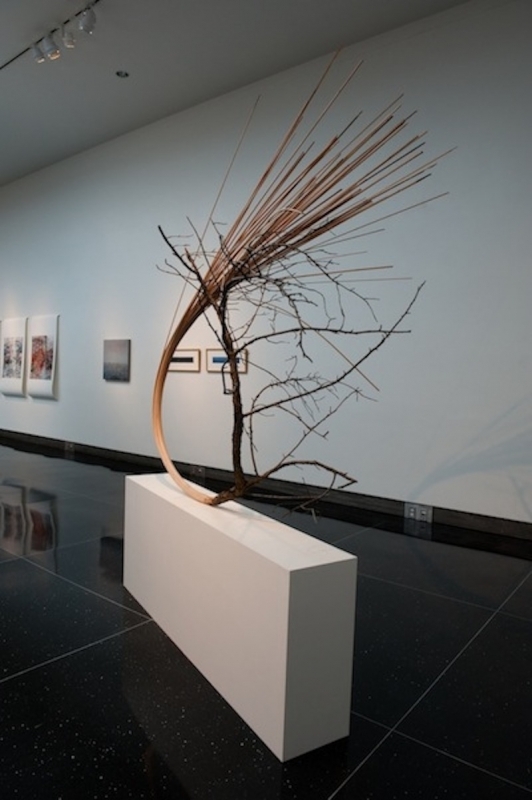 Other pieces, like those from Jim Jacobs, examined the dynamic relationships between nature and man. While some pieces focused on the separation of the two, Jacobs embraced the unity. The carved sculpture began at its base in an altered, fragmented and processed state growing upwards into the whole and untainted branch. The installation no doubt could be interpreted a variety of ways, but I chose to find the meshing of two worlds to be cast in a positive notion. The charm of the event seemed to come from the sense of comfort and familiarity the attendees shared. Students, faculty, friends and the occasional dragged-along-spouse chatted with the artists, who shared not only their messages through their work, but also techniques and methodology. The draw to attend was the art, but the atmosphere invited me to lounge and observe the commodore between the students and their teachers. While I over heard that some were bribed with extra credit, the number who turned out simply to support their professors, view their creations and pay homage to their own ambitions compiled the majority of the crowd. Finishing my rounds, I spotted some daguerreotypes, an overly simplified description of which can be best described as negative images printed on a metallic silver surface. The artist credited with the pieces was Tyler Suppha-Atthasitt, who was standing near by as I jotted down some notes about his daguerreotypes. He asked me what I was writing down and I explained who I was. Our discussion led him to share his extensive knowledge on the history, process, and even storing of the daguerreotypes. Suppha-Atthasitt’s passion and familiarity with his medium reminded me of my own previous affinity with photography. I mentioned my trivial experience on developing negatives in high school, when Suppha-Attasitt explained that he in fact taught photography at the University. I stood somewhat blind sided for a moment—I had momentarily forgotten, despite the Faculty Exhibition being my purpose for attending, that every installation, painting, printing, sculpture and image in the gallery, was the work of not just artists, but the professors teaching at Weber State. Which reminded me of how true a previous statement made by President Wight was, in regards to the faculty “practicing what they teach.” I later justified that my forgetting wasn’t the result of my failure, but the artists overwhelming success. The Weber State University Department of Visual Art & Design Biennial Faculty Exhibition runs from September 5th through November 15th, and precedes the gallery’s upcoming Fall BFA Thesis Exhibition. More information on events at the Mary Elizabeth Dee Shaw Gallery can be viewed through the department’s webpage.